Browsing for posts tagged green chillies. 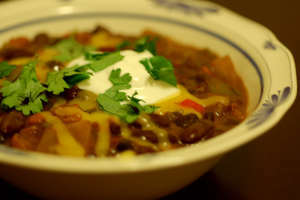 This veggie chili is one of the easiest and most versatile recipes we know, so we make it often. There are a few base ingredients that you’ll always want to include which we always keep on hand, and then you can add lots of other items to suit your taste. This particular batch of chili was really made fantastic by the harvest of green peppers grown in my mom’s garden (thanks mom! ).